Pupil of Joseph Lingard at the Royal Manchester College of Music. Initial studies had been undertaken with Henry Wilson (1896-1984) who played with the Carl Rosa Opera Company. 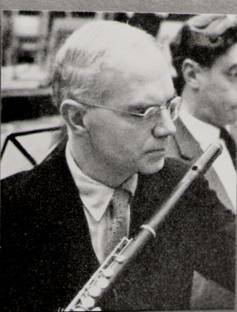 Oliver Bannister was appointed Second Flute in the Hallé Orchestra in 1943 and became principal in 1945, a position he held until 1963. From that time until his retirement in 1986 he played as Principal Flute at the Royal Opera House, Covent Garden. He played on a Rudall Carte wooden flute throughout the whole of his career making a beautiful, warm, rich sound.